I found a recipe on Youtube for a very simple no bake oatmeal cookies. And it's delicious. When working with the computer, I often get the munchies. Back in the days, I got away with eating a lot of junk food such as chips, candies and other goodies. Nowadays, I have to think healthy, yet at the same time, I get the craving for something sweet and chocolatey. 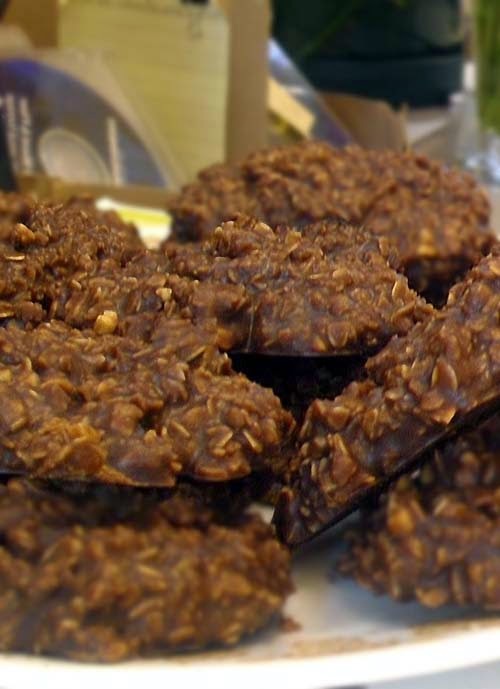 This particular no bake cookie recipe is the answer. It's fudgy. And since it has oats, it's also healthy for the heart and the whole body. Which is great because I'm not as active as I use to be. In a sauce pan, bring to a boil butter, milk, cocoa powder, sugar. Let boil for 1 minute then remove from heat and stir in cooking oats, peanut butter, pinch of salt and vanilla extract. Spoon onto wax paper and let cool for about an hour. I prefer to cool mine in a refrigerator but a cool room will work, too. This is the video I use for reference.